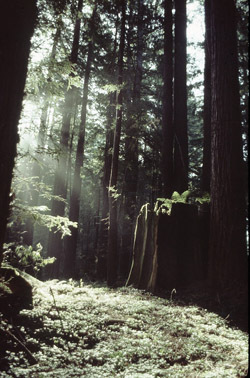 The Mendocino Woodlands Naturalists lead hikes and trips within and beyond the Woodlands, including early morning birding, hikes to see old growth redwoods, and tide pooling. All of the following attractions are within half an hour's drive of the camp. The picturesque town of Mendocino is just 11 miles from the Woodlands, and is well known for its 19th-century charm. The town has lots of fine art galleries, shops and restaurants. Art classes are offered at the Mendocino Art Center. The nearby town of Fort Bragg, 8 miles north of Mendocino, provides most of the necessities and many of the pleasures of life. There is a variety of food and hardware stores, a hospital, many fine restaurants, a growing number of galleries, and a movie theater. The Skunk Train can be boarded in Fort Bragg for a fun trip with stunning scenery.